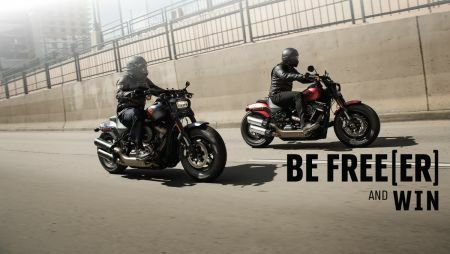 HARLEY-DAVIDSON 2018 Be Free(er)HOW TO ENTER Eligibility Requirements –please read carefully To be eligible to enter, individuals must: •be an Australian or New Zealand resident •be over 18 years of age AND •purchase a neweligible Harley-Davidson Softail motorcycle between 1stof December and 31stof December 2018.To enter: Entrants must: purchase an eligible new Harley-Davidson Softail motorcycle at a participating Australianor New Zealand Harley-Davidson dealership between 1stof December and 31stDecember 2018.TERMS AND CONDITIONS1.Information onhow to enterand prizes formpart of theseTerms and Conditions. Participation in this Promotion is deemed acceptance of these Terms and Conditions.2. The Promoter is Harley-Davidson AustraliaPty Limited(ABN 83 098483 259) of1 Sirius Road, Lane Cove NSW 2066(Postal Address: PO Box 133, North Ryde NSW 1670).3.Entry is only open to individuals who meet the Eligibility Requirements and comply with the entry instructions described in these Terms and Conditions. Employees (and their immediate families) ofthe Promoter, participating dealers and agenciesassociated with this Promotion are ineligibleto enter. Immediate family meansany of the following: spouse, de-facto spouse, child or step-child (whether natural or by adoption), parent, step-parent,grandparent,step-grandparent, uncle, aunt,niece, nephew, brother, sister, step-brother, step-sister or 1st cousin.4.ThePromoter reserves theright, at anytime, to verifythe validity ofentries and entrants (including an entrant’s identity, age, placeof residence, licence status and riding experience) and to disqualify any entrant who submits an entry that is fraudulent or not otherwise in accordance with these Terms and Conditions or any relevant law, or whotampers with theentry process. Each entrant consentsto the Promoter exercising its rights under this clause by their entry into the Promotion.5.Incomplete, indecipherable, or illegible entries may be deemed invalid. For example, entries which do not include the entrant's name, address, daytime contact number and email address will not be accepted. 26.Multiple entries per person are permitted bythe way ofmultiple eligible purchases during the promotional period.7.If there is a dispute as to the identity of an entrant, the Promoter reserves the right, in its sole discretion, to determine the identity of the entrant.8.All entries open at 00.01on 1 December 2018. Entries close at 23.59 (Sydney local time) on 31 December 2018.9.The draw will take place at 1 Sirius Road Lane Cove West, Sydney Australia at 10.00on 14 January 2019.All week draws will take place on the same day.10.The winner will be notified by telephone and email within 24 hours of the draw. The name and suburb of the winner will be published on www.harley-davidson.comon21 January 2019.11.The Promoter will make all reasonable efforts to contact the winner. However, if the Promoter is unable to contact the winner, the Promoter will hold a second chance draw on 28January2019in order to distribute any unclaimed or forfeited prize. Any second chance winner will be notified by telephone and email and/or mail within 24 hours of the second chance draw. The name and suburb of any second chance draw winner will be published on www.harley-davidson.comon11 February 2019.12.The prize offered is the invoice price of the winners eligible motorcycle purchase. The prize value will included the costassociated with registration forone year andthird party insurance.13.Theprize value willexclude any additional parts,accessories or labourcosts associated with the purchase of the motorcycle.14.Thewinnerwillreceivethe value of the prize (being thevalue of the motorcycle purchased as a rebate).The rebate will take the form of an electronic funds transfer to a bank account specified by the winner. 15.The maximum value of the prize will be $35,495 AUD/ $37,500 NZD should the winning customer purchase a Softail FXDR 114.16.All taxes (excluding GST) which may be payable as a consequence of receiving the prize are the sole responsibility of the prize winner.17.Subject to legislative approval, the Promoter reserves the right to withdraw any prize should the Promoter,in its soleand absolute discretion,deem a winnerunfit to participate in the prize for any reason, including (without limitation) as a result of illness, tiredness, or the influence of drugs.18.Before the entrant can participate in the Eligible Test Ride, the entrant may be required to sign additional documents, such as a motorcycle user indemnity deed in relation to his/her use of the test ride motorcycle. Entry into the promotion is conditional upon the winner signing these documents. The winner will be given a reasonable opportunity to review and consider the documents before he/she is required to sign it.